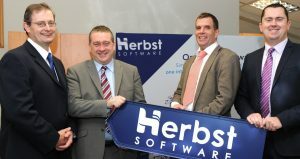 Herbst Software, a leading provider of business management and ERP software, has opened a brand new office space to accommodate its national growth and future expansion plans. The new office space is located in Carrigtwohill Shopping and Business Centre, Carrigtwohill, County Cork, and will provide capacity for increased sales as well as professional services operations for the south-west region of Ireland. The new office is being established to create new jobs and to distribute key company resources across the country in accordance with greater demand for business management software. For further information visit www.herbstsoftware.com.